Our Orange County based distribution center provides customized logos, handset on our spirit jewels and glitters, to major schools, universities and pro teams across the country! 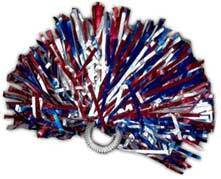 We even produce customized colored poms so that fans can join the action and demonstrate their team spirit with pride. For examples, why not check out our products section. Gameday. School Spirit. Team pride. School spirit and team pride. At GO TEAM SPIRIT we know how important it is for fans to be able to show pride in their team. Now their favorite team logos can sparkle on their skin for the world to see! And with team spirit stronger than ever, our patent-pending wrist poms are leading the way! Fans no longer have to hold the poms in their hands. They can now attach them to just about anything with the elastic wrist band that’s built in! Our Spirit Jewels and Stickits were proudly worn by gold medallists during the closing ceremonies at the U.S. Olympics games. Now your school can look just as inspiring when used by your teams, fans and classmates who are ready to cheer their athletes on to victory with the power of team spirit. We are licensed to produce products for many universities and teams. All GO TEAM SPIRIT products have MINIMUM QUANTITY PURCHASES. We may be able to accommodate some smaller orders for poms, facepaint and beads, contact us for more information. Die - $55.00; Color Match - $115.00. There will also be a set-up fee of $150.00 when ordering custom logos/mascots for our Glitter Stickits and Jewels; a $50.00 set-up fee is assessed on new orders for our heart, wave, circle and stripe Glitter Stickits and Jewels. We thank you for the opportunity to allow us to bring fun and spirit to your fans & teams. Catch the GoTeamSpirit fever today!